Writers are lucky. Because of the Internet, written content is at an all-time premium. Writing is everywhere online – and probably needed the few places it doesn't appear. However, with writing so prevalent it can be a difficult task for someone to get their writing to stand out. Here are some tips on tools you can use to promote your craft. Social media is huge and will only continue to get bigger. Even more beneficial than the size, however, is the fact that social media marketing is free. Face it: the people who are most likely to read your writing are your friends and family. Chances are that your social media network is already chocked full of friends and family so you might as well mix a little business with pleasure. Tweet and post Facebook updates about your work; discussing your writing reminds people that you are a writer. If you are posting work on your profile or have some on another website, then link to it. Funnel the loyal traffic you already have. You should build your profile so that when someone looks at it they know you're a writer and can easily access your work. Blogs can also be great free exposure. An aspiring writer can create their own blog, choosing from tons of free and supported layouts/themes, or can approach blog owners about guest posting. If you create your own blog then it can be a tall order to keep the content updated. If a blog doesn’t keep fresh content then the posted items begin to sour; that's why many blog owners welcome guest posts that help them continue to provide fresh content. 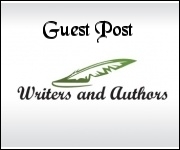 If you are looking to write guest posts, then approach bloggers and websites that have a similar interest. Perhaps you discuss comic books and book art a lot on your Twitter feed. If so, then an illustration blog may be the perfect site to approach. It can also be beneficial to let other bloggers post on your site because they will surely funnel some of their traffic your way. Whether you post on your own website or someone else's remember to give credit where it is due. Link all of your profiles, networks and posts together so that someone can easily read more about you and your work. It may seem weird to make posters or business cards for your blog or Twitter feed, but traffic is traffic and if you pique someone's curiosity enough then they may just visit your site. If the work there is up to snuff then you can easily gain some loyal followers. Creating contests can also be a great way to generate buzz. Offer up something relevant to your blog—a book, a day with you, an album—to whomever comes up with the best caption for your photo or designs the best logo for you. These can be fun experiences but you can also benefit from them. Remember that buzz fades quickly, so maintaining the excitement requires a consistent effort. About the author: Holly Watson is a student working towards her doctorate in literature. She has an obsession with literature and social media.